Recognize market opportunities, master the design process, and develop business acumen with this 'how-to' guide to medical technology innovation. A three-step, proven approach to the biodesign innovation process - identify, invent, implement - provides a practical formula for innovation. The experiences of hundreds of innovators and companies, in the form of case studies, quotes and practical advice, offer a realistic, action-orientated roadmap for successful biodesign innovation. Real-world examples, end-of-chapter projects, and Getting Started sections guide the reader through each of the key stages of the process and provide a template to create their own new medical devices. 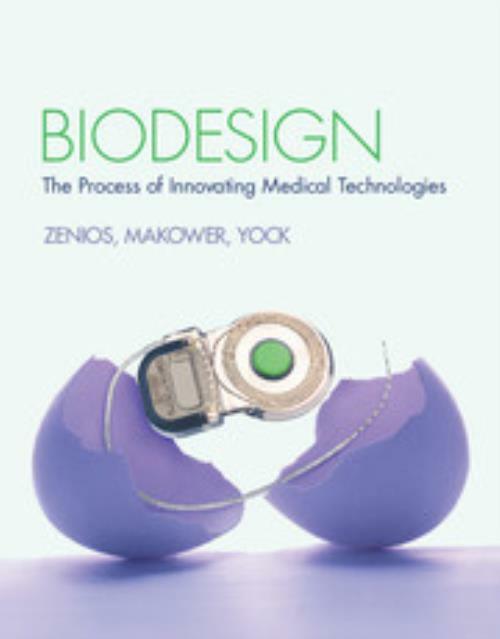 Addressing common medical, engineering, and business challenges to develop well-rounded expertise, this book is the complete package for any biodesign entrepreneur. The text is supported by valuable resources, including up-to-date industry changes: found at ebiodesign.org. 29. Licensing and alternate pathways; Case study; Index. Stefanos Zenios Stanford University, California. Stefanos Zenios is the Charles A. Holloway Professor at the Graduate School of Business, Stanford University. His pioneering work on maximizing the benefits of medical technology to patients when resources are limited has influenced policies in the US and Europe. He has quantified the ethical implications of technology allocation choices on patients and society as featured in the Financial Times and Times.com. At Stanford University, he was the first to introduce courses on the interface between medicine, engineering, and management in the MBA curriculum. Dr Zenios advises medical device and biopharmaceutical companies on health economics and outcomes studies for marketing and reimbursement strategies. He is also a co-founder of Culmini Inc., a company funded by the National Institutes of Health to develop web-tools that help patients and families with difficult choices. Josh Makower Stanford University, California. Josh Makower is the founder and Chief Executive Officer of ExploraMed, a medical device incubator. He is also a Venture Partner with New Enterprise Associates, a Consulting Associate Professor at Stanford University Medical School, and a co-founder of Stanford's Biodesign Innovation Program. Dr Makower has founded several medical device businesses including Moximed, Vibrynt, NeoTract, Acclarent, TransVascular and EndoMatrix. Up until 1995, he was founder and Manager of Pfizer's Strategic Innovation Group. He holds over 50 patents in various fields of medicine and surgery, an MBA from Columbia University, an M.D. from NYU, and an S.B. in Mechanical Engineering from MIT. Paul Yock Stanford University, California. Paul Yock is the Director of the Stanford Biodesign Program and the founding Co-Chair of the Department of Bioengineering at Stanford University. He is known internationally for his work in inventing, developing, and testing new medical devices, including the Rapid Exchange™ balloon angioplasty and stenting system, which is now the principal system in use worldwide. He also authored the fundamental patents for mechanical intravascular ultrasound imaging and founded Cardiovascular Imaging Systems. In addition, he invented a Doppler-guided access system known as the Smart Needle™ and PD-Access™. Dr Yock holds 55 US patents and has authored over 300 papers, mainly in the area of catheter-based interventions and technologies. He has been elected to membership in the National Academy of Engineering and has received several prestigious awards, including the American College of Cardiology Distinguished Scientist Award. Todd J. Brinton Stanford University, California. Todd J. Brinton is a Clinical Assistant Professor of Medicine (Cardiovascular) and Bioengineering (by courtesy) at Stanford University. He is an interventional cardiologist at Stanford University Medical Center and investigator in interventional-based therapies for coronary disease and heart failure. He is also the Fellowship Director for the Biodesign Program, and Co-Director of the graduate class in Biodesign Innovation at Stanford University. Dr Brinton completed his medicine, cardiology, and interventional training at Stanford University. He holds an M.D. from the Chicago Medical School and a B.S. in bioengineering from the University of California, San Diego. He is co-founder of BioParadox, Inc., a venture-backed medical device company and serves on the advisory board for a number of early-stage medical device companies. Prior to medical school he was the Clinical Research Director for Pulse Metric, Inc., a medical device start-up company. Uday N. Kumar Stanford University, California. Uday N. Kumar is the founder and Chief Medical Officer of iRhythm Technologies, Inc., a venture-backed medical device company focused on developing new devices and systems for the detection of cardiac rhythm disorders. He is also the Associate Director, Curriculum of Stanford-India Biodesign and a Lecturer in Bioengineering, and has served as an Adjunct Clinical Instructor of Cardiovascular Medicine, all at Stanford University. In these capacities, he mentors, advises, and teaches students and fellows about the biodesign process. Dr Kumar completed a Biodesign Innovation fellowship at Stanford, cardiology and cardiac electrophysiology fellowships at the University of California, San Francisco (UCSF), an internal medicine residency at Columbia University, and his medical and undergraduate education at Harvard University. He was also Chief Medical Officer and Vice-President of Biomedical Modeling Inc., a medical start-up company. Lyn Denend Stanford University, California. Lyn Denend is a Research Associate at Stanford University's Graduate School of Business, where she has authored numerous case studies for use in graduate-level and executive education programs in areas such as strategic management, international business, supply chain management, healthcare, and biodesign innovation. Previously, Ms Denend was a Senior Manager in Cap Gemini Ernst & Young's management consulting practice and Vice President of Operations for a start-up providing human resource services. She has an MBA from Duke University's Fuqua School of Business and a BA in Communications from the University of California, Santa Barbara. Thomas M. Krummel Stanford University, California. Thomas M. Krummel is Emile Holman Professor and Chair in the Department of Surgery, and Co-Director of the Stanford Biodesign Program, at Stanford University. He has been a pioneer and consistent innovator throughout his career, and has served in leadership positions in many of the important surgical societies including the American College of Surgeons, the American Pediatric Surgical Association, the American Surgical, the American Board of surgery, the American Board of Pediatric Surgery, and the American Board of Plastic Surgery. Over the last 14 years, Dr. Krummel has pioneered the application of technology to simulation-based surgical training and surgical robotics. For his work in this area, and developing a collaborative simulation-based surgical training system, he has received two Smithsonian Information Technology innovation Awards.